Hello, Nerdy Book Club readers. It’s Amy here. I have a new middle grade book coming from Arthur A. Levine Books in October and I want to tell you about it. But first, let me show you the cover and talk about it for a minute—BECAUSE I LOVE THIS COVER. I’ve arrived at that point in my career where I don’t have a clue what kind of cover art will be sent my way. I’ve also arrived at the point in my career where I trust the heck out of book and cover designers because they’re able to somehow express the larger ideas of a novel in a visual way. This is a talent I cannot grasp but highly respect. All Hail Book Designers! A few months ago, my editor, Nick Thomas, reached out and asked me if I liked some sample artwork from an artist named Simon Prades. I really loved the sample he sent and I said yes, please, I love his style. Little did I know that Simon would be able to see my main character, Liberty, the way I also see her. Add to Simon’s artwork the design that Elizabeth Parisi applied to the entire book jacket package, and you have one of my favorite book covers yet. I was wowed when this artwork arrived in my inbox. 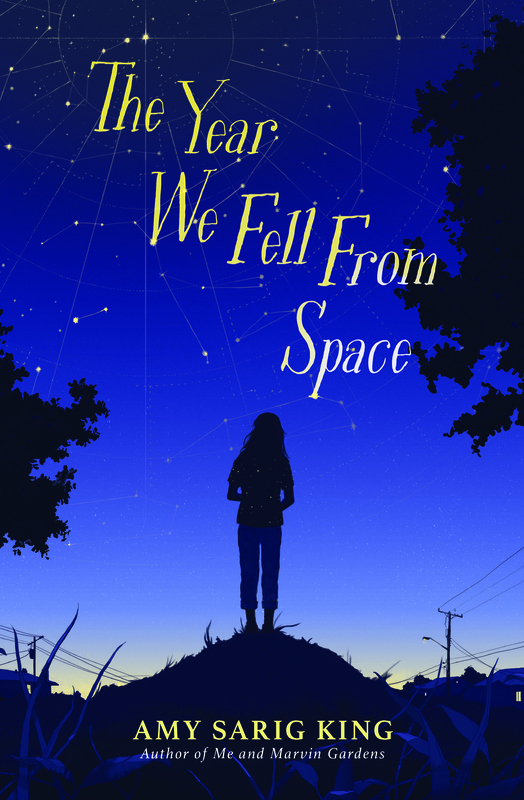 Liberty Johansen’s love of the stars is paramount in this book. She doesn’t just love them—she is guided by them and when she looks at the night sky, the stars show her how she’s feeling…which is important because a lot of times, Liberty doesn’t know how she’s feeling. Liberty isn’t having a good year. She is concerned about her parents, who are divorcing. She’s worried about her father, who has some form of depression which isn’t openly discussed (which makes her worry more, as people tend to do if they aren’t given enough information.) And she is also dealing with the fear that she may one day suffer from the same disease. So this cover—Liberty from behind, the night sky spread out before her, big and beautiful—really fits the book’s central ideas, and Liberty’s vast confusion during this time in her life. I hope you love the cover as much as I do. And when it’s time, I hope you love the book as much as I do. Mostly, I hope that it changes your ideas about the night sky and that you can see your feelings in what you see—that you can bond with something older than all of us and find its wisdom the way Liberty does. That’s what this cover says to me, and for that reason, it’s simply perfect. Thanks for having me around to reveal The Year We Fell From Space. I hope to see you all soon! Amy Sarig King has published many critically acclaimed young adult novels under the name A. S. King, including Please Ignore Vera Dietz, which was named a Michael L. Printz Honor Book, and Ask the Passengers, which won the Los Angeles Times Book Prize. After many years farming abroad, she now lives back in southeastern Pennsylvania, with her family. Visit her website at http://www.as-king.com and follow her on Twitter at @AS_King. Wow! Beautiful. Thanks for sharing this – can’t wait to read it. I love the cover and loved Marvin Gardens! Liberty’s story sounds like one I want to have in my classroom. Thanks for sharing! This cover is stunning! I look forward to reading about Liberty and entering her world. Thank you for your talented contributions to the children’s literature field, Amy. Love it and YOU, kiddo💕 Thanks for sharing! Hello! I have just retired from 3+ decades of Gifted Intermediate ELA teaching, and try as I might I just can’t stick with adult books. A treasure like your book excites me to the core. I agree—what a perfect cover. I will read it, and share it with all who will listen! Thank you!!! Love the cover!! This sounds like a must read. I’ll be looking for your book! What a lovely cover — can’t wait to read it! Such a beautiful cover! I loved Marvin Gardens (in fact it was one of my favorites of 2017!) and I’m really looking for award to meeting Liberty!